On the morning of Dec. 20 groups of North Hastings High School's Grade 11 English students from teacher Heather Taylor's Indigenous Voices class, gathered for the annual Taylor Reads competition. Taylor has modelled the competition loosely after CBC's Canada Reads. Students work in small groups and have 10 days to read a chosen book and summarize it to a panel of judges and convince them their book is the best and explain why they should read it. After a warm welcome by NHHS social worker, Marsha Depotier, the judges were introduced. Representing the Hastings Prince Edward District School Board were Troy Maracle, Indigenous education lead and Summer Bertrand, Indigenous support worker. Depotier and school principal Wayne Stewart also participated on the judging panel. Teacher Heather Taylor explained that the students had 10 days to read a novel written by an Indigenous author and to become experts on it. She noted that some of the students had to overcome a lot of adversity to accomplish this task. Some had not actually read a book in its entirety nor presented publicly previously. Taylor reviewed the criteria that the judges were to look for in each group, knowledge of the novel, enthusiasm, connections to classwork, how the novel fits into real world issues and an overall impression. She also asked the judges to consider whether the students have made you want to read the book. Each student group had up to seven minutes to make their presentation. The books that were chosen by the students included The Missing, The Absolute True Diary of a Part-time Indian, Where the Rivers Meet, Goodbye Buffalo Bay, Medicine Walk, Keeper ‘n Me, Arctic Thunder and The Marrow Thieves. The students demonstrated they had not only read the novels selected, but were able to draw connections to real life social issues in the Indigenous community, current events and historical challenges. After each group had finished, and the votes tallied, Taylor announced that the first prize winner went to Angus Woodcock and Dante Gentles for their presentation on The Marrow Thieves, a young adult novel written by Cherie Dimaline. The novel takes place in the dystopian future where people have lost the ability to dream. Indigenous people who can still dream are hunted for their marrow to create a serum to treat others. Second prize was awarded to Bella Sobry and Gabey Johnson for their presentation on Where the Rivers Meet, written by Don Sawyer. Third prize went to Briana Kruger, Liah Wood, and Dakota Lesperance for their presentation on Medicine Walk, by Richard Wagamese. Taylor thanked each of the students for stepping out of their comfort zone. 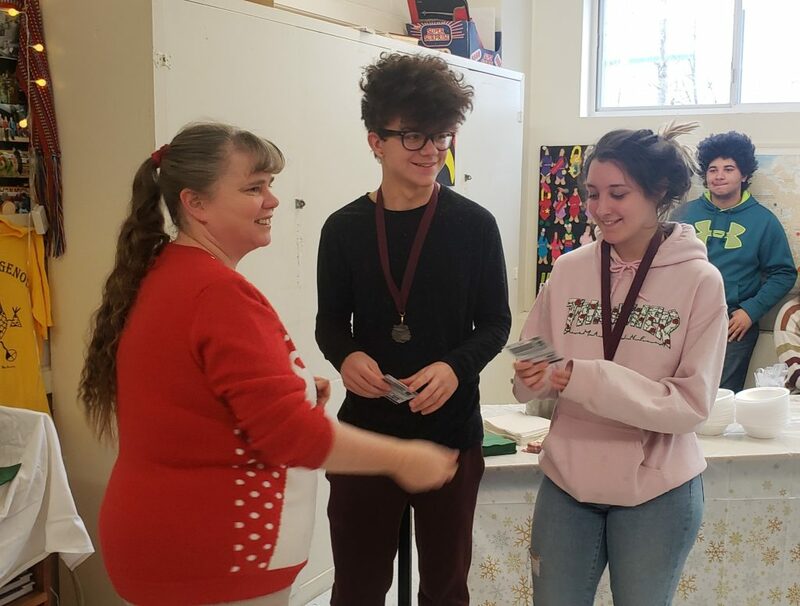 Medals and gift cards were presented to the winning groups and then Taylor announced that the giant Hershey chocolate bar that had been on display would be shared among everyone. Taylor Reads concluded with everyone enjoying a hot lunch in the classroom.